The Central Michigan Chippewas host the Eastern Michigan Eagles at Kelly/Shorts Stadium on Wednesday, November 8, 2017. The opening line for this game has Eastern Michigan as 2 point favorites. The Chippewas have an over/under record of 3-6-0 and they are 4-5-0 against the spread. The Eagles have an ATS record of 7-2-0 while their over/under record is 3-6-0. 11/01/17 DL Joe Ostman Undisclosed is "?" 11/01/17 TE Logan Hessbrook Concussion is "?" The Eastern Michigan Eagles have run for 978 yards as a team, which ranks 121st in college football. They've run 289 times, averaging 3.4 yards per carry as a rushing unit. The Eagles have been penalized on offense 62 times for 582 yards so far this season, which has them 37th in the country in penalties. They are 90th in the nation in points scored with 222. They have run 631 plays this season for 3,474 yards, which ranks them 30th in Division 1 in total offense. The Eagles average 5.5 yards per play, which is 79th in college football. As a team they have accumulated a total of 181 1st downs this year, placing them 78th overall as an offensive unit. Brogan Roback averages 7.1 yards per pass attempt and 6.8 adjusted yards per throw. He has completed 202 passes on 332 attempts for a completion percentage of 60.8%. His quarterback rating this year is 129.3. He has thrown for 2,347 yards this season. The Eagles rush defense has allowed 371 attempts for 1,562 yards this year, putting them in 74th place in D-1 against the run. Eastern Michigan has committed 64 penalties for 565 yards on the defensive side of the ball this season. That ranks them 97th in college football. They are 29th in the nation in points allowed on defense with 183. They have surrendered a total of 3,189 yards on D, which is 40th in the country. The Eagles are ranked 27th in yards per play allowed with 5.1. 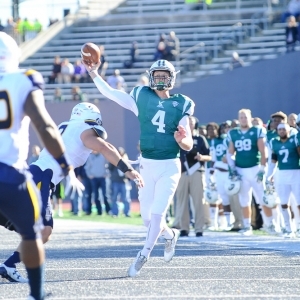 Opposing offenses have completed 141 passes on 253 attempts against the Eastern Michigan Eagles defense this season, placing them 23rd and 29th in Division 1. The Eastern Michigan pass defense has also given up a total of 1,627 yards through the air, which is 22nd overall in total pass defense. The Eastern Michigan Eagles have attempted 16 field goals this season and made 10, which is 64th in D-1. Their kickers have a field goal percentage of 63%. Eastern Michigan Eagles kickers have made 96% of their extra points, going 24 for 25 this year. Their punters have totaled 2,050 yards on 53 punts, averaging 39 yards per punt. That places them 114th in Division 1 in punting average. Eastern Michigan is ranked 15th in the nation in punt returns with 20. They've accumulated 112 punt return yards and average 5.6 yards per return, which is 84th in college football. They have returned 24 kicks for 390 yards on special teams, ranking 109th in kick return yardage. The Eagles average 16 yards per kick return and they are 94th in the country in all-purpose yards with 3,975. The Chippewas are 72nd in the country in points scored with 241. They have run 667 plays this year for 3,536 yards, which ranks them 45th in Division 1 in total offense. The Central Michigan Chippewas average 5.3 yards per play, which is 94th in the nation. As a team they have accumulated a total of 176 1st downs this season, ranking them 84th overall as an offensive unit. On the ground Central Michigan has run for 1,258 yards as a unit, which ranks 91st in college football. They've run 321 times, averaging 3.9 yards per rush as a unit. Central Michigan has been penalized on offense 55 times for 541 yards so far this year, which has them 68th in the country in penalties. Shane Morris has passed for 2,209 yards this year. He's completed 182 throws while attempting 330 passes for a completion percentage of 55.2%. His quarterback rating this season is 122.7. He averages 6.3 adjusted yards per throw and 6.7 yards per pass attempt. Central Michigan is 70th in the country in points surrendered on defense with 244. They have given up a total of 3,458 yards on D, which is 57th in D-1. The Chippewas are 32nd in yards per play allowed with 5.2. Opponent offenses have completed 150 throws on 278 attempts against the Central Michigan defense this season, ranking them 40th and 59th in the nation. The Central Michigan Chippewas pass defense has also surrendered a total of 1,606 yards in the air, which is 16th overall in total pass defense. Their rushing defense has given up 392 attempts for 1,852 yards this season, putting them in 108th place in the country against the run. The Chippewas have had 64 penalties for 549 yards on defense this year. That places them 88th in college football. Central Michigan is 87th in the country in punt returns with 11. They've totaled 72 punt return yards and average 6.5 yards per return, which is 73rd in D-1. They have returned 29 kicks for 519 yards on special teams, which puts them 54th in kick return yardage. The Central Michigan Chippewas average 18 yards per kick return and they are 82nd in the nation in all-purpose yards with 4,127. The Chippewas have tried 9 field goals this year and made 6, which is 110th in college football. Their kickers have a field goal percentage of 67%. Central Michigan kickers have made 96% of their extra points, going 27 for 28 this season. Their punters have accumulated 2,745 yards on 64 punts, averaging 43 yards per punt. That ranks them 40th in the NCAA in punting average. Who will win tonight's Eagles/Chippewas college football game against the spread?